broadcast by Kossuth Radio on 29 May 2003. Recorded prior to the first action. advertisement surfaces around Moszkva square would vanish by having them covered in colored coatings, In contrast, nothing is covered. What has happened? advertisements everywhere, from billboards and lights on rooftops through, small fly-bills pasted onto lamp posts, to boards carried by sandwich men. In the end, due financial constraints, I have only been able to succeed in realizing the minimum project. Reporter: And what do you mean by "minimum project"? Eperjesi: The original idea included homogenizing shopping bags. The bags you get at shops are in fact living and moving advertisements, which in principle make you not any different from a sandwich man. We are going to put these shopping bags under wraps. Reporter: What's your goal with this? Eperjesi: I would like to call people's attention to the fact that by carrying such bags with a particular advertisement or brand name on, we are doing the given businesses as a favor. I can imagine that many people are not only unaware of it, but are truly pleased to obtain a good shopping bag free of charge for having bought a given item. First off, you can be sure that you haven't received it for free. Secondly, from that moment on you are working as an unpaid employee of the given firm. Reporter: Do you think that this will really change people's attitudes? Reporter: How will you go about doing this? Eperjesi: Here are some quite big and strong unicoloured blue bags. 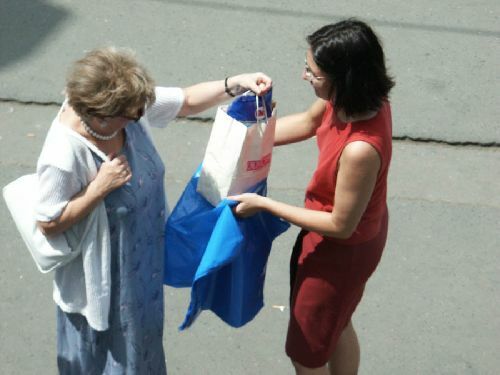 We simply start conversations with people carrying bags with brand names, and if the agree, we simply slip their bags into the bigger blue ones. It's a simple move. As a matter of fact, this person receives a truly free bag, which does not advertise anybody or anything. Reporter: Let's try it out! Here comes a woman, carrying a bag bearing a brand name. Eperjesi: Good afternoon. May I ask you who do you work for? district kindergarten. Why do you want to know? label on it, you are like a living advertisement, as if you were their employee. Young woman: No, as I have just told you I work at a kindergarten. Eperjesi: And do you work there for free? You must really like children if you are willing to work for free at that kindergarten. that? Of course I am paid for my work. Eperjesi: Well, then of course you get some form of commission from this company, don't you? If you don't work free for your employer, why do you do so for this company? Young woman: I don't get any money from them. I got this bag when I bought something in their shop. Eperjesi: What would you say to me giving you a bag, which has no wording on it whatsoever, and we put your bag into it? Then at least you would not be advertising a company, that hasn't paid you remuneration for your services, not to mention a company that you have already given money to. Young woman: OK, let's put it in. After all, you are right. Why not? Thank you. All best, and good bye. Reporter: Well, that went quite smoothly. I'm sure that you will encounter some situations that are more difficult than this one. What will you do if someone does not agree with you? Eperjesi: I won't oblige them in any way. Reporter: Good luck with your action. Eperjesi: Thank you. Good bye.